The Bathurst Family History Group has carried out a significant amount of restoration and maintenance of existing headstones at the Bathurst Cemetery and has erected a number of headstones on unmarked graves over recent years. A number of individuals have sought assistance in recognising a family member who is buried at the cemetery, but whose exact location is unknown. 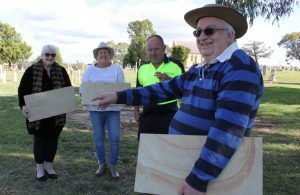 Bathurst Regional Council has now given the Group its approval to erect a wall in the old monumental section which would enable members of the public to have attached a suitable plaque in memory of a relative. It is intended that relatives will be able to apply and pay for a set, standard design, memorial plaque of a fixed size at a fee of $450, for any deceased person where it can be established that they are buried in the Cemetery and died before 1970. The Bathurst Family History Group will construct the memorial wall in the old monumental section of the Bathurst Cemetery, administer and assess all plaque applications, the supply and installation of plaques, and be responsible for the ongoing maintenance of the wall. The Group will undertake all works at their own cost, with part funding provided by an already approved Council Heritage Grant. Applications to: Bathurst Family History Group via this website shortly.